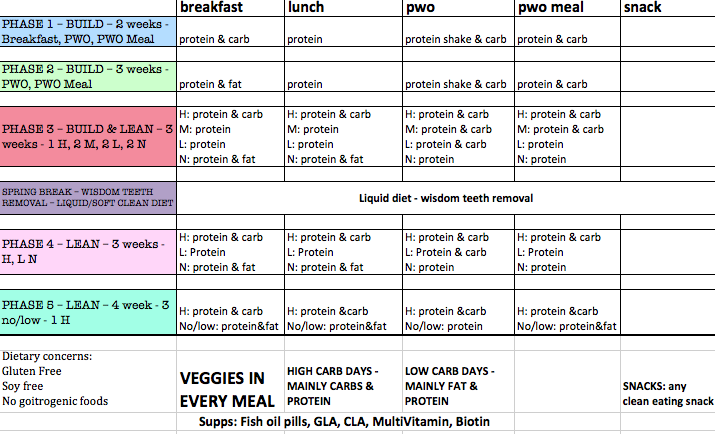 Again, repost of my earlier 16 week plan! That post messed up my blog layout! So here it is again! 4-5 meals a day – I like to eat a bit fuller meals, so I won't be eating every 2 hours. More like 2-4 hours. 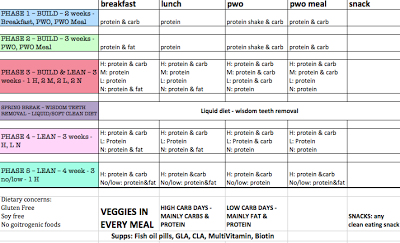 Instead of 6-7 meals with fewer cals, I'll be having 4-5 with a bit fuller calories. IF YOU CLICK THE IMAGE, IT WILL BECOME LARGER! During the building stage I'll have proteins and carbs high, fats low. During the carb cycling stage, my low days will have higher fat for energy and low carbs, and the opposite on high carb days. Protein still high. Protein choices: eggs, chicken breast, turkey breast or ground turkey, sirloin, shrimp, salmon, tilapia, whey protein, etc. Snack can be whenever you're hungry, can be after lunch, before lunch, after dinner, whenever! I don't usually count calories and you alll know how much I advocate that! So I won't be using any kind of calorie counter, just "eyeballing" my portion sizes and guestimating. If I reach a plateau, I can either decrease my calories or increase my workouts. Imagine if you're already on a dangerously low deficit of 1100-1200 calories. You decrease to 1000. Now you've reached another plateau. Do you think going down to 900 or 700 will be good for you? NO. So think about it in the long-term! It's going to be higher in the beginning because I want to BUILD muscle, therefor I can't have too big a deficit in calories! Then as the phases go on and I want to lean, the added cardio will make the deficit, NOT lessening food calories drastically to dangerous levels. This is my big plan for 2013! What do you all think?? I'm hoping to see some MAJOR changes! And I'm very excited! I've been SLACKING off SOOOOO hard these past few weeks/months, and it definitely shows! And with my new SLOW metabolism from killing my thyroid, it's going to be ESPECIALLY hard trying to lose all the extra fat I've accumulated. But I'm keeping my head up, trying to be positive, and hopefully everything will take care of itself! So are you going to join me to a fab fitter 2013 year? I hope so! Remember, these numbers are for ME and my current body weight and goals, switch yours around accordingly! And my schedule is based off MY needs, and are scheduled around my classes, when I work, and what foods work best for my body. Please make adjustments where needed!